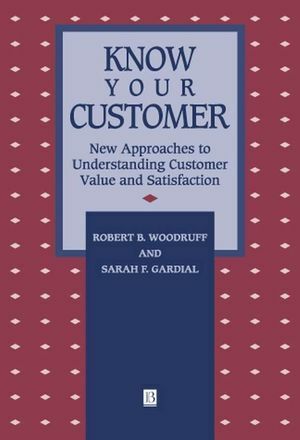 Intended for business students and managers who want to become more customer-oriented, this book focuses on helping managers develop information skills for understanding customers' perceptions of value and satisfaction. Dr. Woodruff is Distinguished Professor of Marketing at the University of Tennessee. He has published four books and over 40 articles on such topics as marketing management, market opportunity analyses, customer value and satisfaction, and consumer behaviour. Dr. Woodruff has worked with more than 20 organizations to help them with marketing planning, market analysis, and customer value and satisfaction measurement activities. He is also a speaker in management development programs. Dr. Gardials research interests are in the areas of customer value and satisfaction, situational influences in the buying and choice process, information processing, and consumer/salesperson interactions. She is an instructor in the executive training institutes conducted through the Management Development Center at the University of Tennessee, Knoxville. She has published articles from her research in journals such as the Journal of Consumer Research, Journal of Advertising, Marketing Letters, and the Journal of Satisfaction, Dissatisfaction and Complaining Behaviour. Part I: Building a Competitive Advantage by Knowing Your Customer:. 1. Achieving a Competitive Advantage Through Customer Value Delivery Strategies. 2. Customer Value in Market Opportunity Analysis Processes. Part II: Learning About Customer Value and Satisfaction:. 3. A New Perspective on Customer Value. 4. Linking Customer Value to Customer Satisfaction. 5. Know Your Customer Through Customer Value Determination. 6. How Customer Value Determination Improves Business Decisions. Part III: Customer Value Determination Techniques:. 8. Analyzing Customer Value Data. 10. Analyzing Customer Satisfaction Data. 11. Predicting Customer Value Change. Appendix I: The Coding Process. Appendix II: Identifying Strategically Important Customer Value Dimensions. Appendix III: Customer Value Change Forecasting Techniques. "Focuses on helping managers develop information skills for understanding customers' perceptions of value." The Bookseller. Integrates customer value and satisfaction into a comprehensive systematic measurement process called customer value determination. Discusses predictions of future changes in customer value and satisfaction. Explores actual company experiences which illustrate measurement techniques. Every step of customer value determination is discussed in depth.